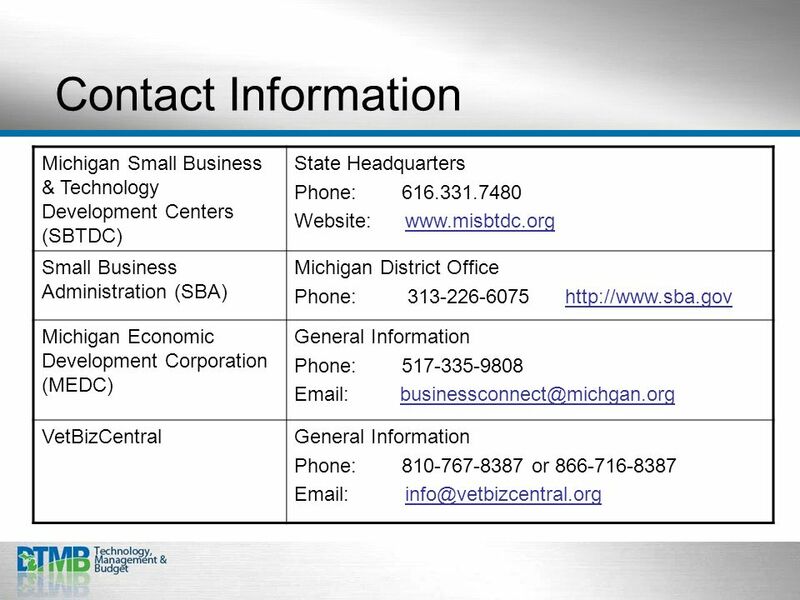 Your guide to doing business with the State of Michigan. 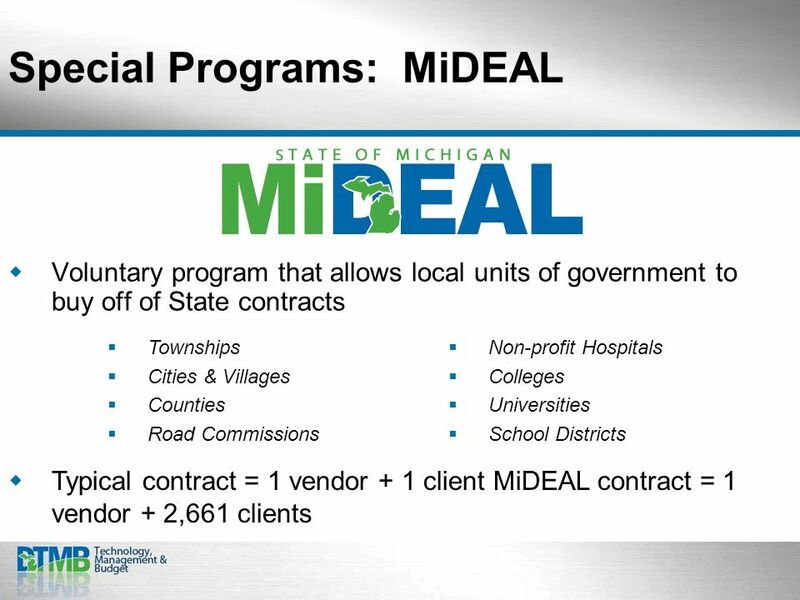 State Contracting 101 How Michigan Businesses Become State Contractors. 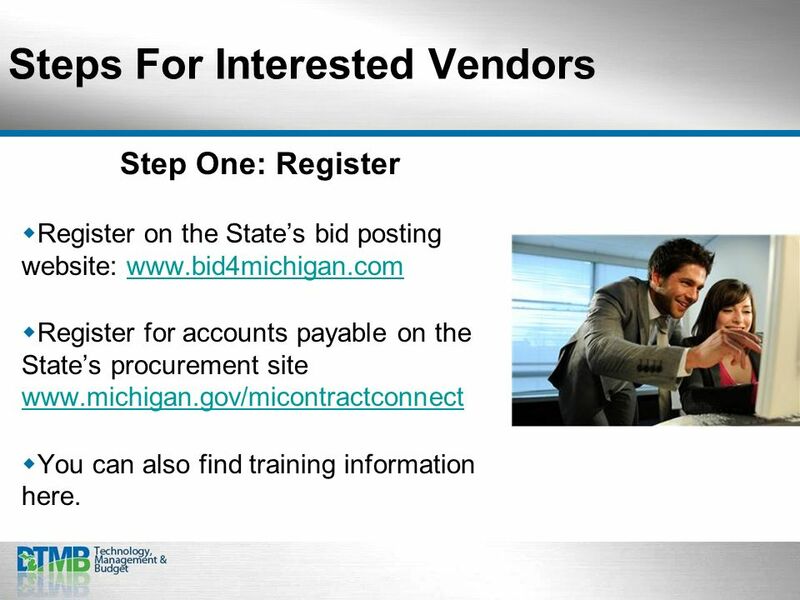 8 Steps For Interested Vendors Step One: Register Register on the States bid posting website: www.bid4michigan.comwww.bid4michigan.com Register for accounts payable on the States procurement site www.michigan.gov/micontractconnect www.michigan.gov/micontractconnect You can also find training information here. 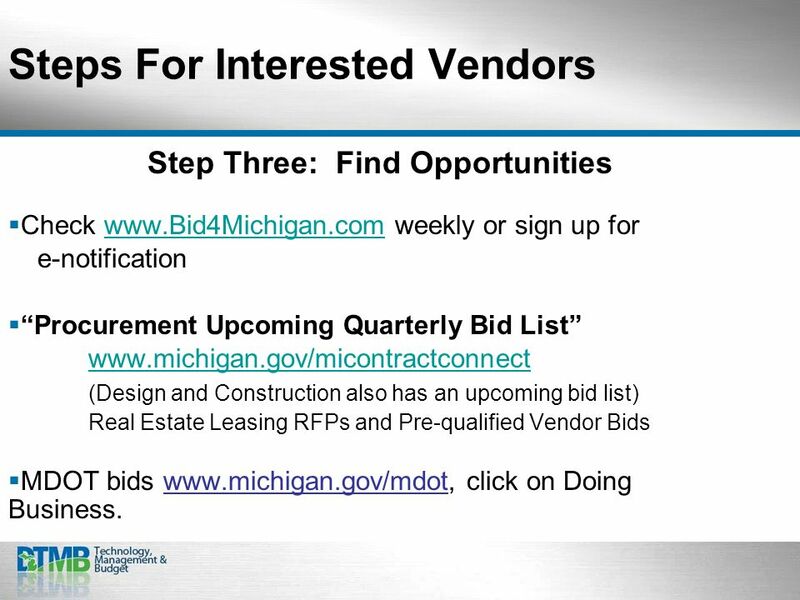 13 Steps For Interested Vendors Step Three: Find Opportunities Check www.Bid4Michigan.com weekly or sign up forwww.Bid4Michigan.com e-notification Procurement Upcoming Quarterly Bid List www.michigan.gov/micontractconnect (Design and Construction also has an upcoming bid list) Real Estate Leasing RFPs and Pre-qualified Vendor Bids MDOT bids www.michigan.gov/mdot, click on Doing Business. 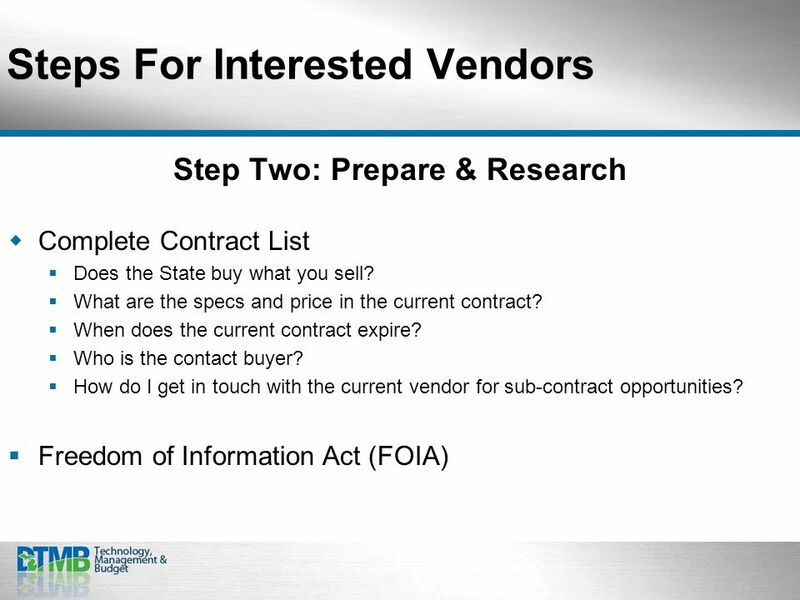 15 Steps For Interested Vendors Step Four:Bid & Evaluation Process Attend Pre-Bid Meeting Ask Questions Email to the buyer by the Q&A due date and time specified in the bid. 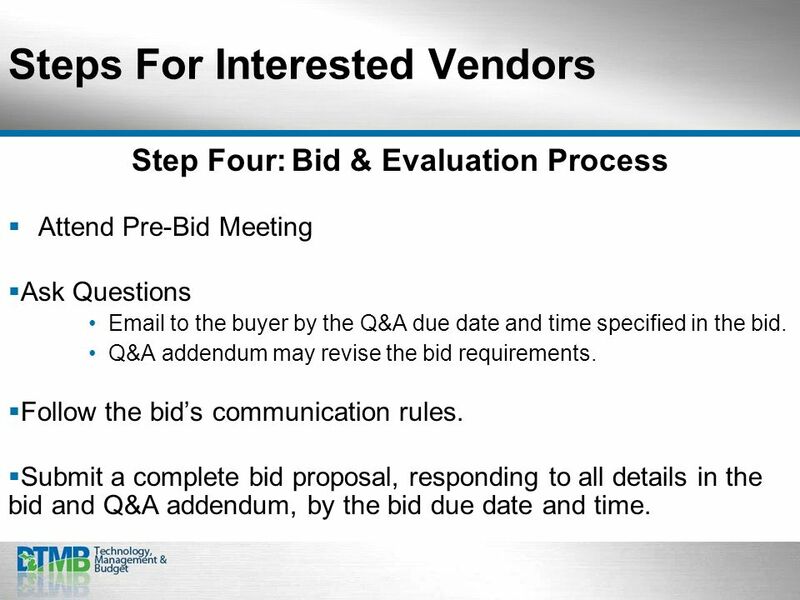 Q&A addendum may revise the bid requirements. Follow the bids communication rules. 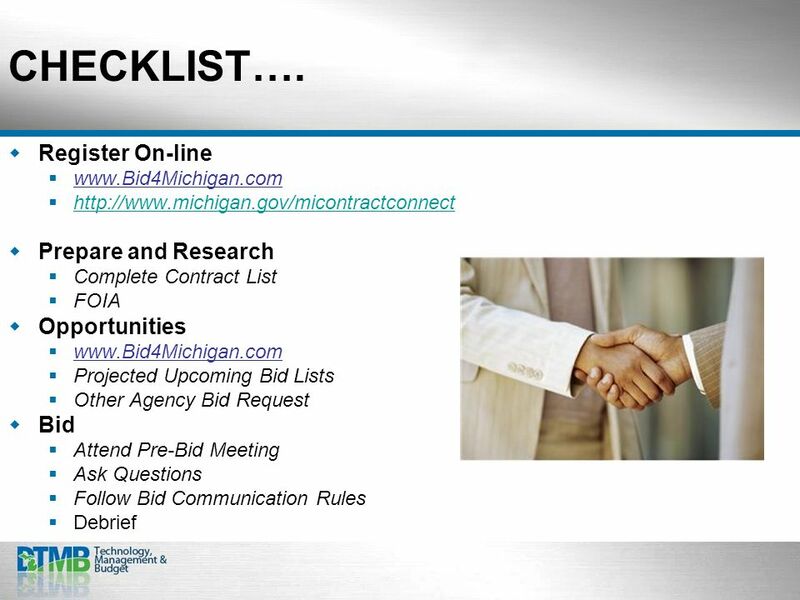 Submit a complete bid proposal, responding to all details in the bid and Q&A addendum, by the bid due date and time. 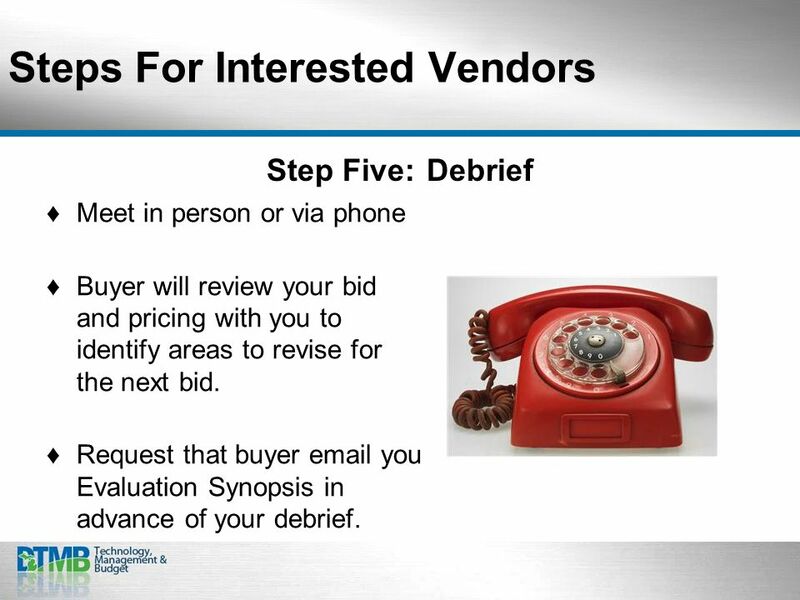 18 Steps For Interested Vendors Step Five:Debrief Meet in person or via phone Buyer will review your bid and pricing with you to identify areas to revise for the next bid. 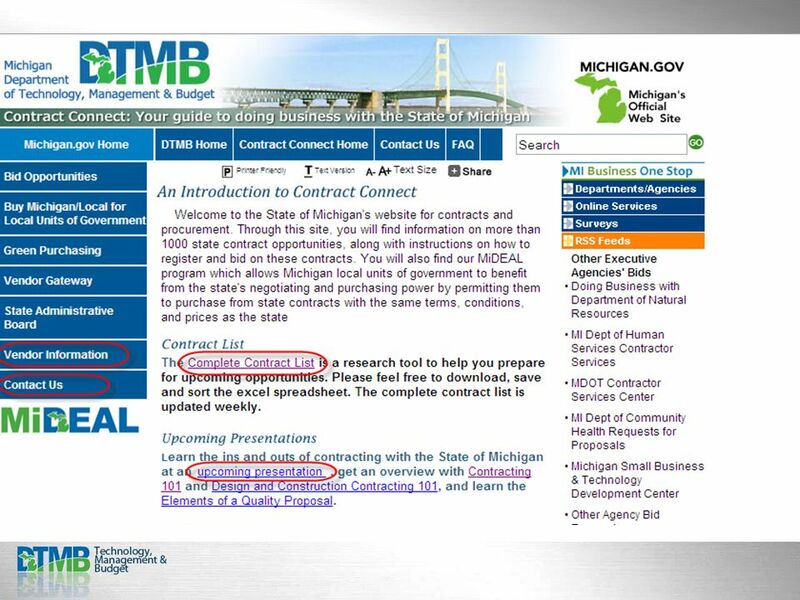 Request that buyer email you Evaluation Synopsis in advance of your debrief. 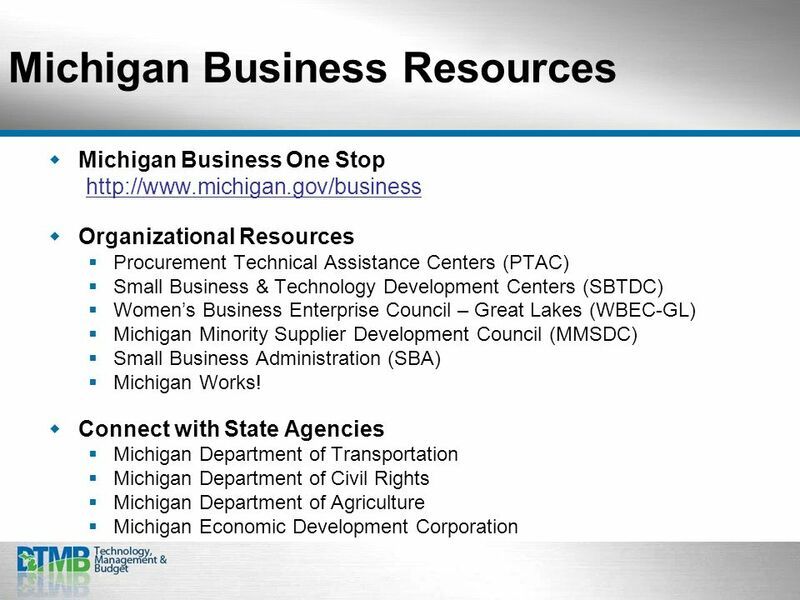 Download ppt "Your guide to doing business with the State of Michigan. 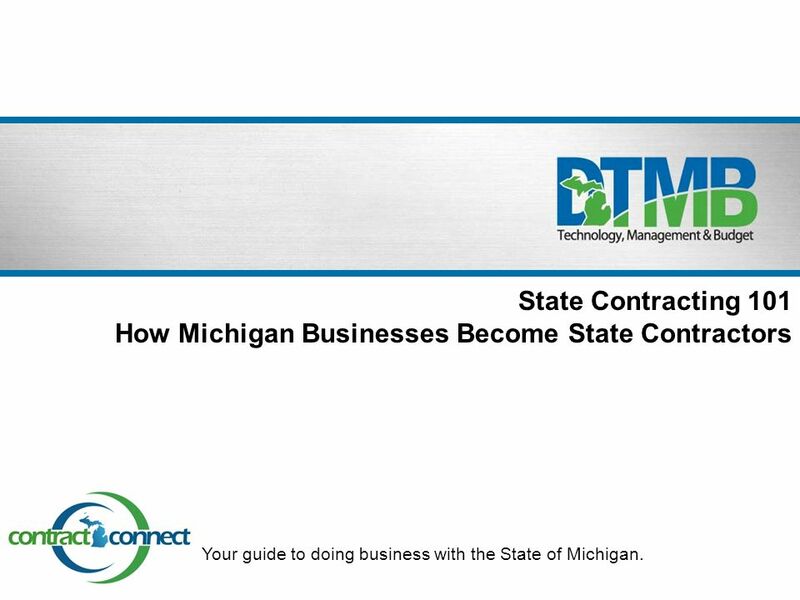 State Contracting 101 How Michigan Businesses Become State Contractors." 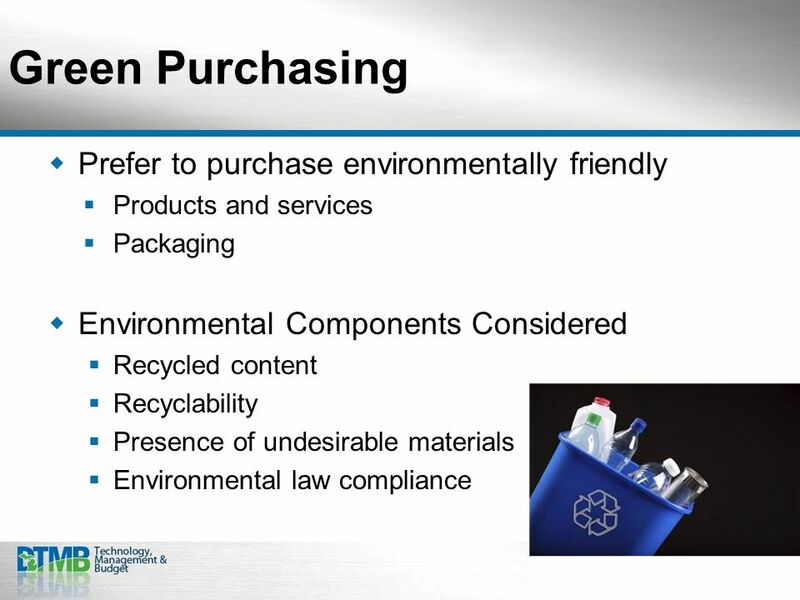 Maryland Green Purchasing Committee - Overview Green Purchasing Committee information and resources, including this presentation, can be found on the DGS. THE HELP PROCESS. 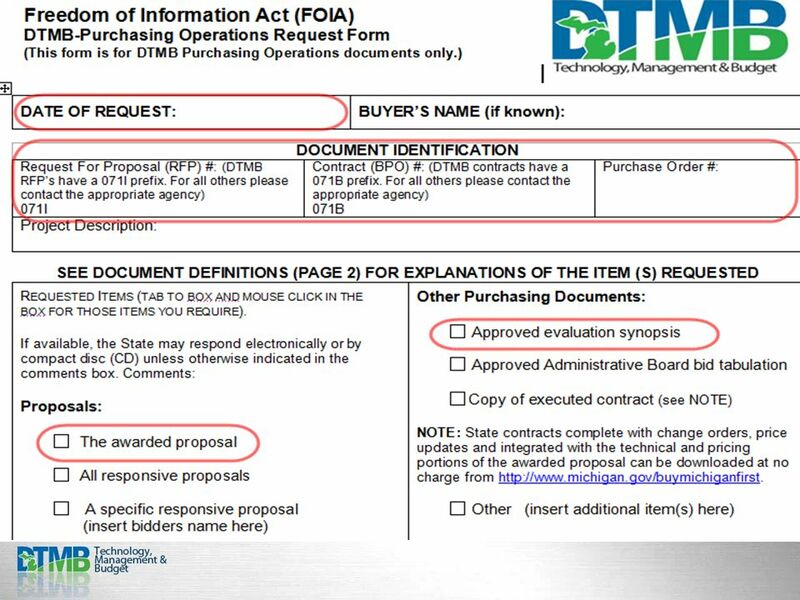 Professional medical equipment project management is the systematic, knowledgeable process through which all items of capital equipment. Case Study: University of Southampton Dr Neil Smith Environment Manager 20 th November 2007. 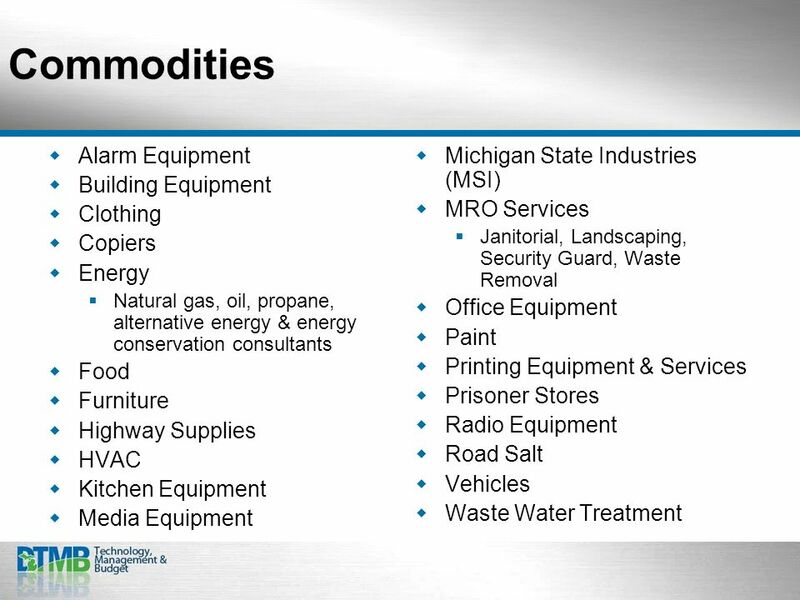 How to Buy Goods & Services Purchasing Services Financial Services Division. 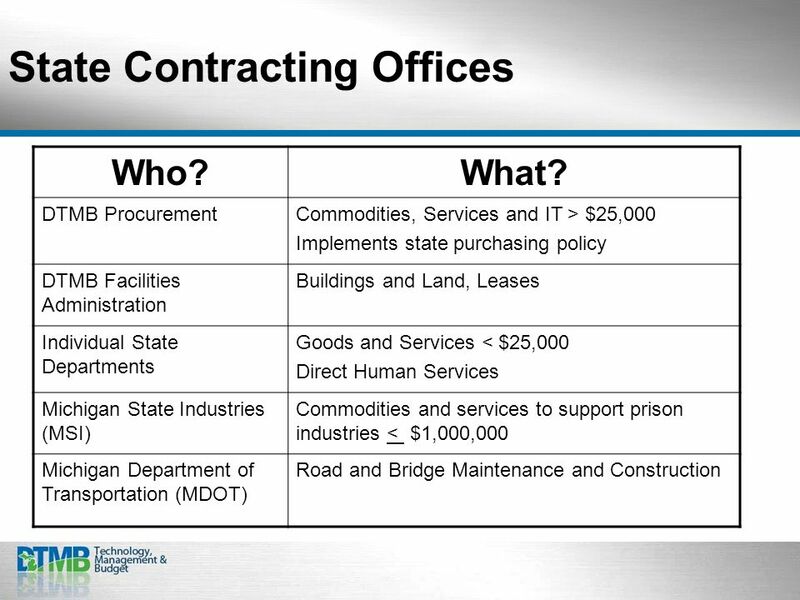 WORLD BANK Overview of Procurement Opportunities Peter R. Easley, Esq. 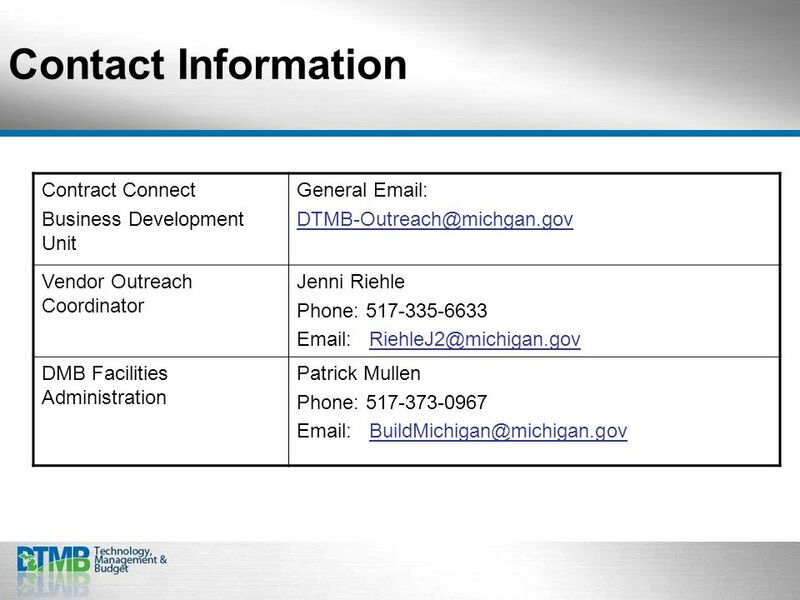 Office of Training and Outreach Copyright© Operational Services Division All Rights Reserved Welcome to the Operational Services. 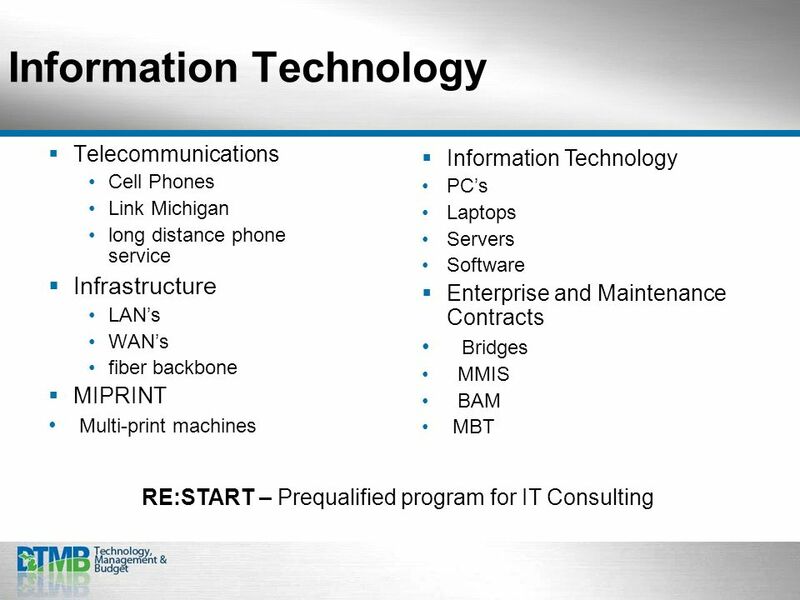 And some other tips. Society of Government Travel Professionals Educational Conference September 5, 2012 Washington DC Tim Hay State of Oregon. MyFloridaMarketPlace for Vendors. 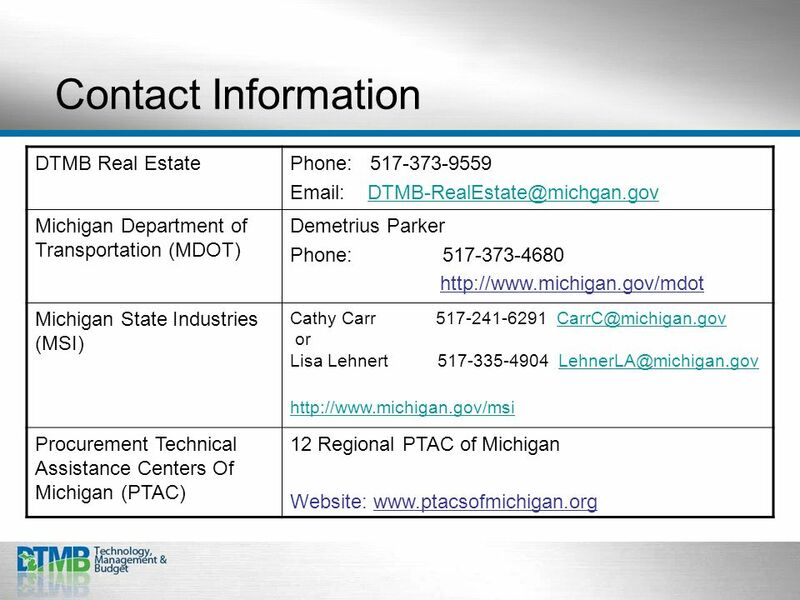 Agenda MyFloridaMarketPlace Registration Overview Overview – State of Florida Purchasing Resources for Marketing to. 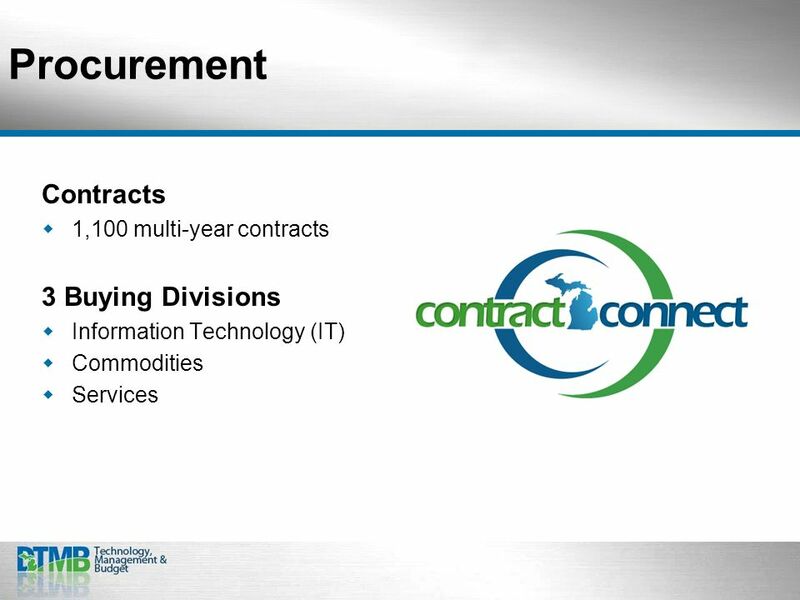 Glasgow City Council: Spend & Opportunity Presented by Gerry Quinn, Contract Manager, Corporate Procurement Unit. 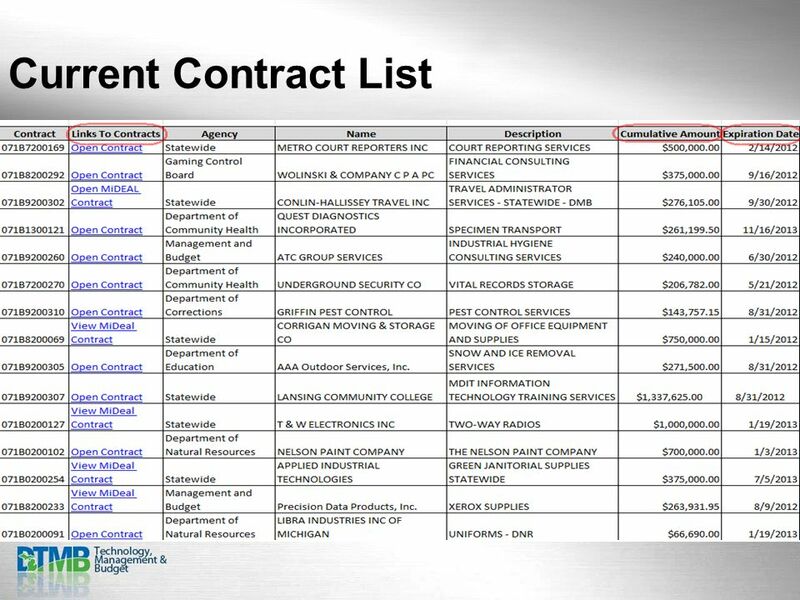 Natural Gas Firm & Interruptible Contracts Statewide Contract Webinar – October 31, 2013. 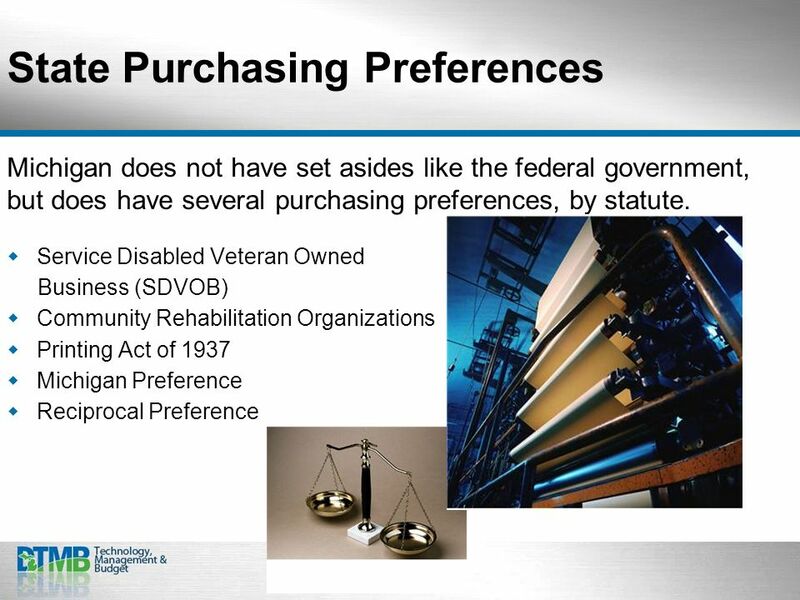 State of Nebraska Procurement Presented to: Veterans in Business Forum Lincoln, NE - June 7, 2013 Omaha, NE – June 13, 2013. 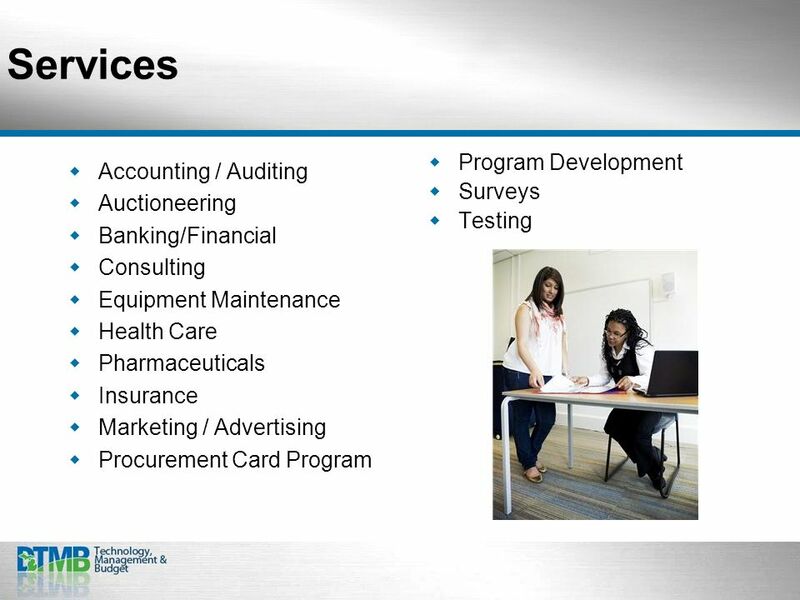 Doing Business with the State of North Carolina NC Division of Purchase & Contract E-Procurement/Education Outreach Opportunities 2010 Presented by Tony. 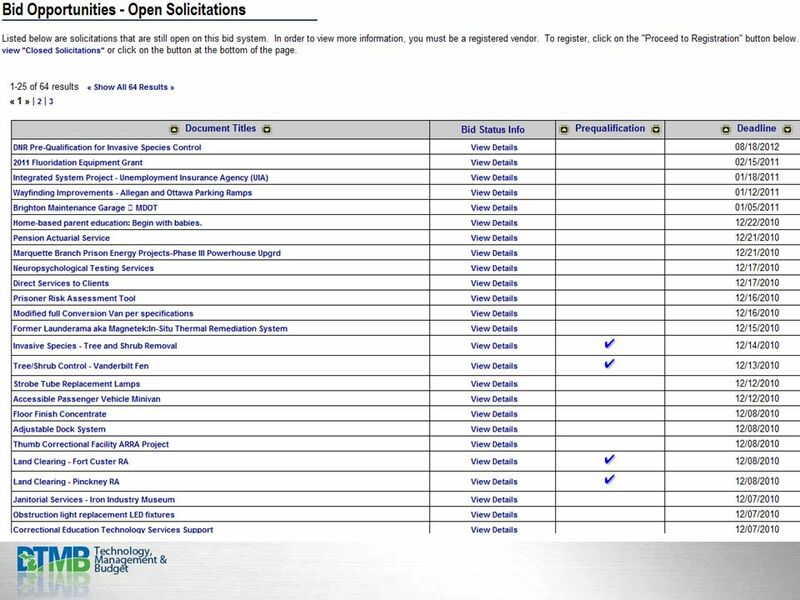 JOHN DEIGHAN CHIEF PURCHASING OFFICER ALLEGHENY COUNTY DEPARTMENT OF ADMINISTRATIVE SERVICES DIVISION OF PURCHASING. 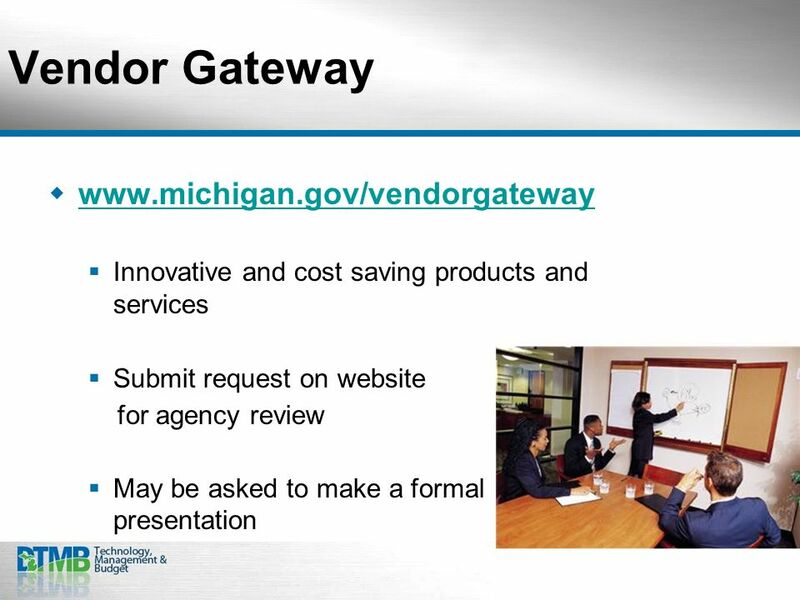 Department of Finance Gillian Blake Senior Procurement Manager Date : 10 October 2014 Selling to State Government/ Low Value Contracting.